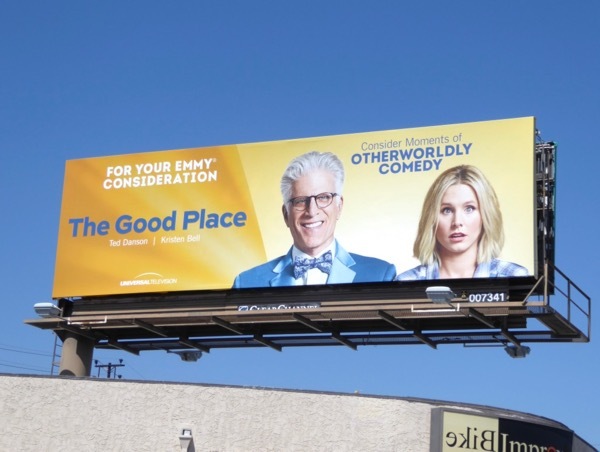 Our specially themed EMMY WEEK continues today with these billboards from Universal Television and NBC that ask you to 'Consider Moments of' honesty, radical optimism, otherworldly comedy, hair-raising excitement, super-sized laughs, arresting humor, betrayal, motherly love and more besides. 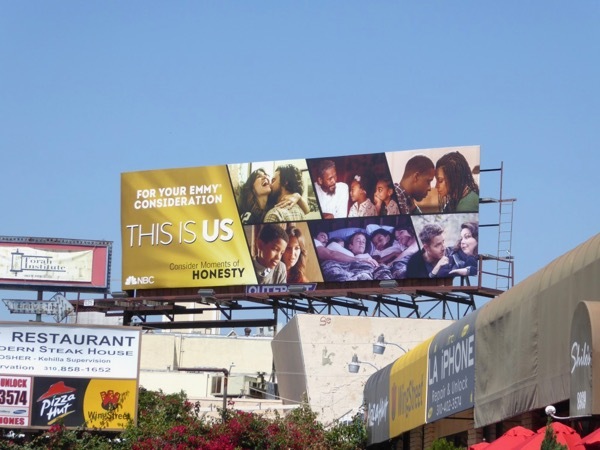 First up is a FYC billboard for NBC's smash hit freshman show, This is Us. The tearjerker ensemble drama follows the lives of three siblings (Sterling K. Brown, Chrissy Metz and Justin Hartley) born on the same day and their parents (Mandy Moore and Milo Ventimiglia) with the unique story twist of featuring flashbacks from the past with them as children to the modern day and their grownup lives. 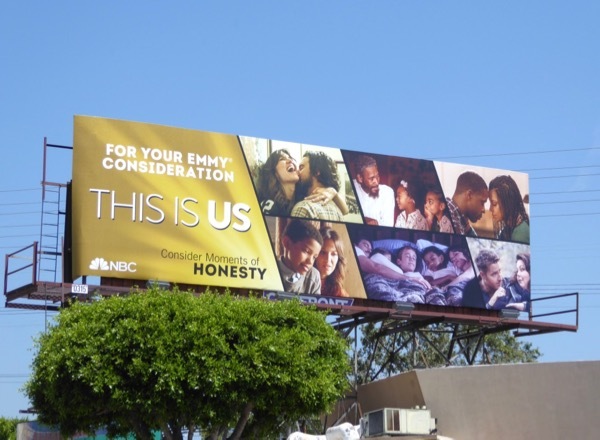 This Emmy consideration billboard showing some of the pivotal relationships in the series was photographed along Pico Boulevard on June 9, 2017. 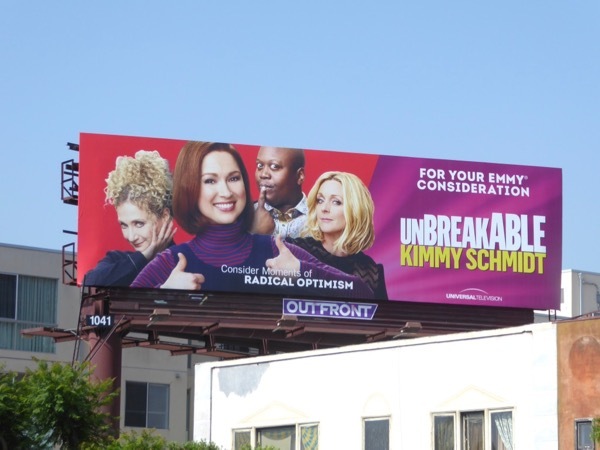 Next up is Universal Television's Emmy consideration billboard for the third season of Unbreakable Kimmy Schmidt, following Ellie Kemper's eternal optimist and her eclectic New York friends played by Carol Kane, Tituss Burgess and Jane Krakowski. 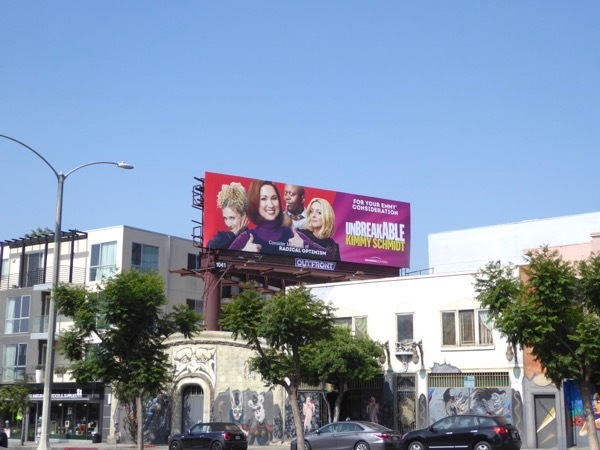 This FYC billboard was snapped along Fairfax Avenue on June 1, 2017, and you can also check out these Unbreakable Kimmy Schmidt season three billboards from Netflix which incorporate an Emmy consideration message. The Netflix comedy has garnered eleven Emmy nominations in the past (sadly with no wins), so let's see if voters give it the thumbs up this season. 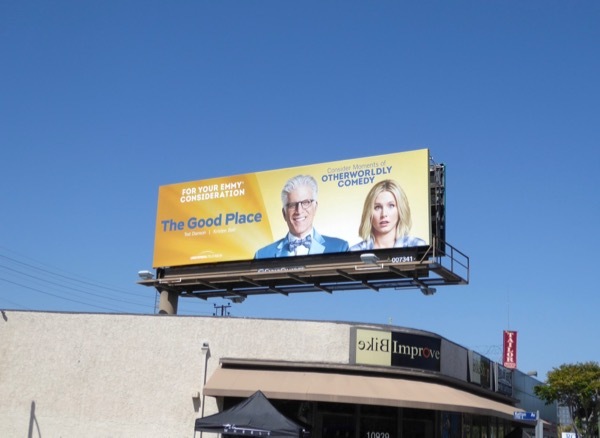 Speaking of quirky comedies, and the first season of heavenly sitcom The Good Place starring Ted Danson and Kristen Bell is hoping to garner some industry accolades this season. This bright ad creative for your Emmy consideration as spotted beside Santa Monica Boulevard on June 9, 2017. NBC kickstarted the trend for live musicals back in December 2013 with The Sound of Music, then followed it up to varying success with Peter Pan and The Wiz. 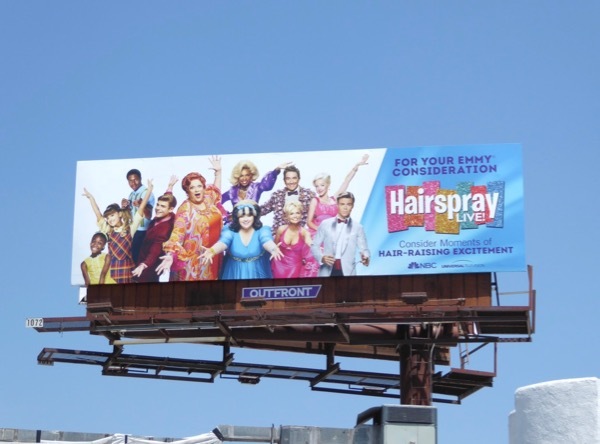 This year 'Tracy Turnblad' (Maddie Baillo) and the early 60s Baltimore musical Hairspray received the live broadcast treatment with an all-star cast that included Jennifer Hudson, Kristin Chenoweth, Derek Hough, Martin Short, Harvey Fierstein, Ariana Grande and more. 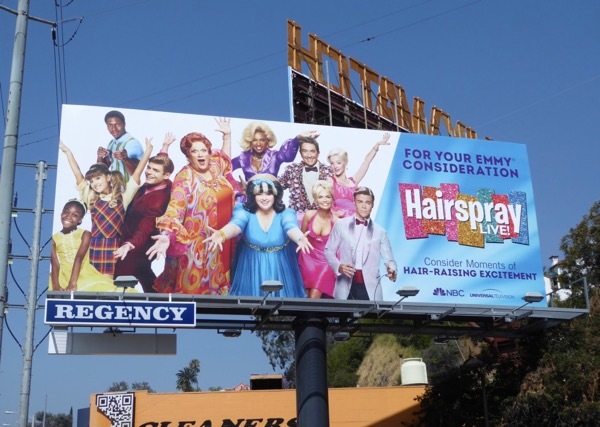 These vibrant Emmy consideration billboards for Hairspray Live! were snapped along West Hollywood's Sunset Strip on June 2 and above Westwood Boulevard on June 9, 2017. This past year the employees of the Cloud 9 Superstore returned to entertain viewers for a sophomore season. 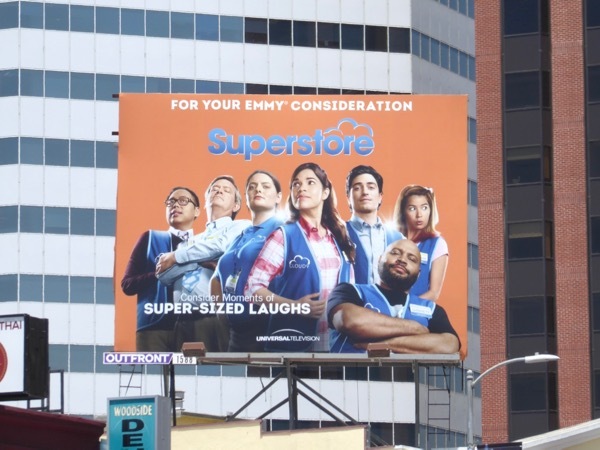 These Emmy consideration billboards for the comedy starring America Ferrera and Ben Feldman were snapped along Highland Avenue on June 3 and above Westwood Boulevard on June 9, 2017. 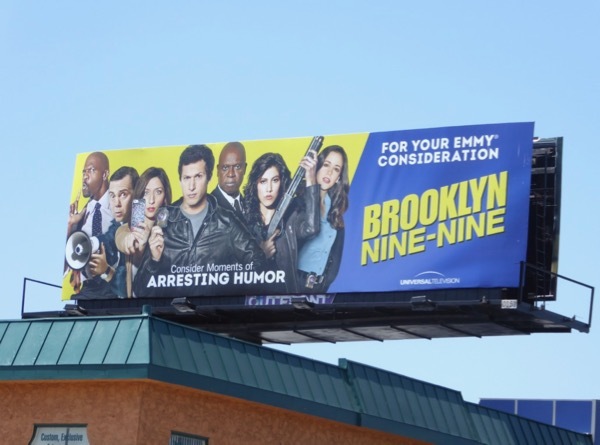 Meanwhile police precinct parody Brooklyn Nine-Nine was back on the beat for a fourth fun season led by Andy Samberg's 'Detective Jake Peralta'. 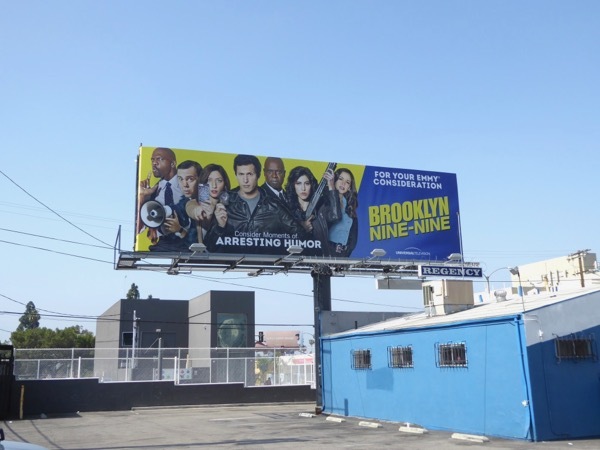 These Emmy consideration billboards for the cop comedy were spotted along Fairfax Avenue on June 2 and above Pico Boulevard on June 9, 2017. 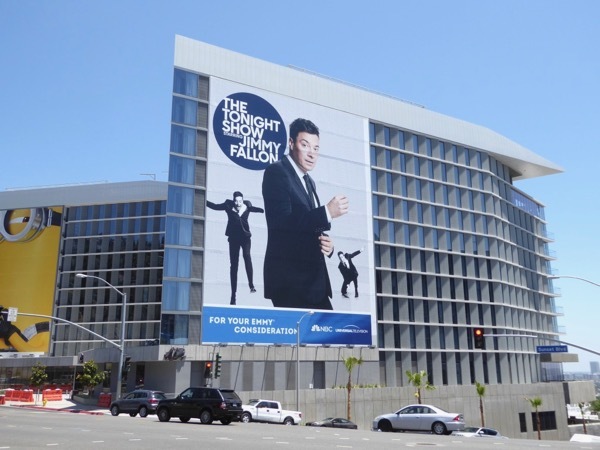 In the world of late-night talk show hosts Jimmy Fallon is not be faring so well of late compared to his other competitors after his disastrously fawning interview with U.S. presidential hopeful Donald Trump where he messed up the reality TV star's hair. 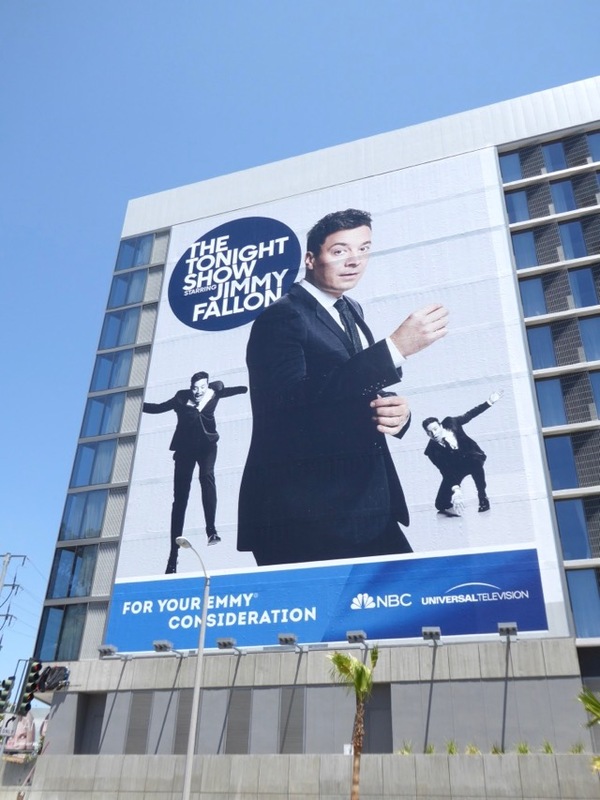 However that doesn't stop NBC from showing some super-sized support for the host of The Tonight Show and the standard landscape billboard was spied above Highland Avenue on June 7, whilst the giant-sized version was snapped along West Hollywood's Sunset Strip on June 9, 2017. 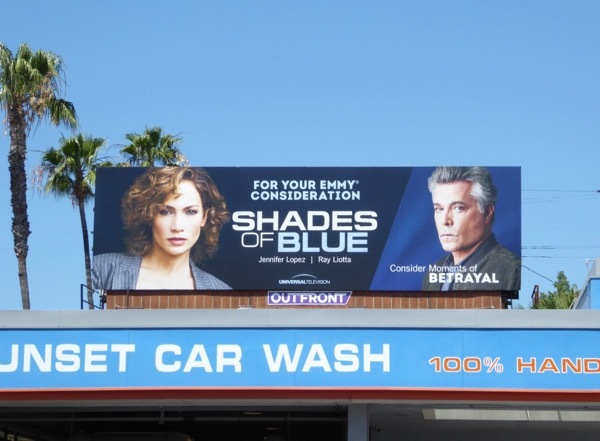 When it comes to drama Jennifer Lopez and Ray Liotta continued to entertain audiences with the second season of NBC's dirty cop series, Shades of Blue. 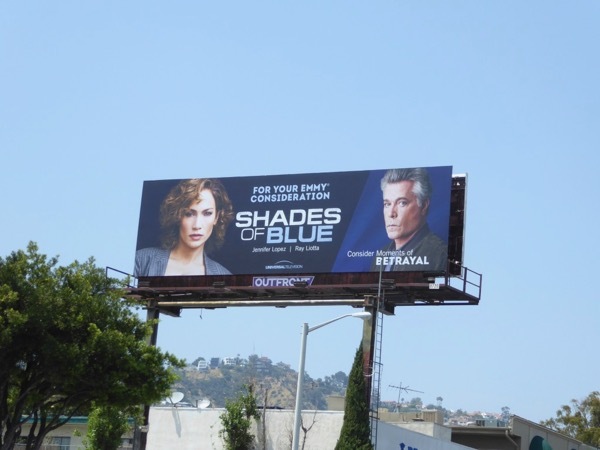 These Emmy consideration billboards for the police drama were photographed above Fairfax Avenue on June 1, then later along Sunset Boulevard on June 12, 2017. 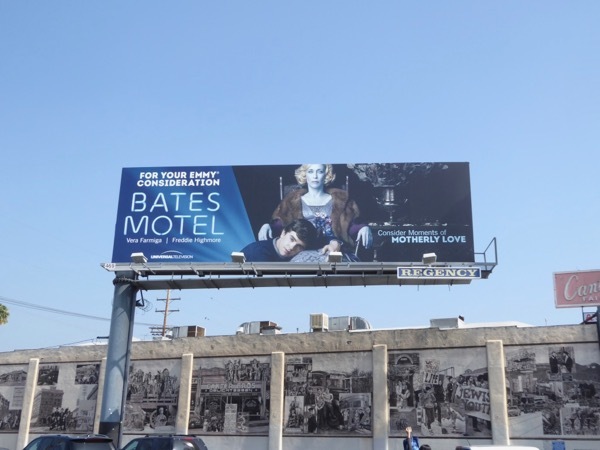 And this year A&E's contemporary Psycho prequel series, Bates Motel, came to an end with its fifth and final season starring Freddie Highmore as 'Norman Bates' and Vera Farmiga as his mother. The series following their dysfunctional relationship has garnered three Emmy nominations in the past, but can Norman take an Emmy home for mother this season? 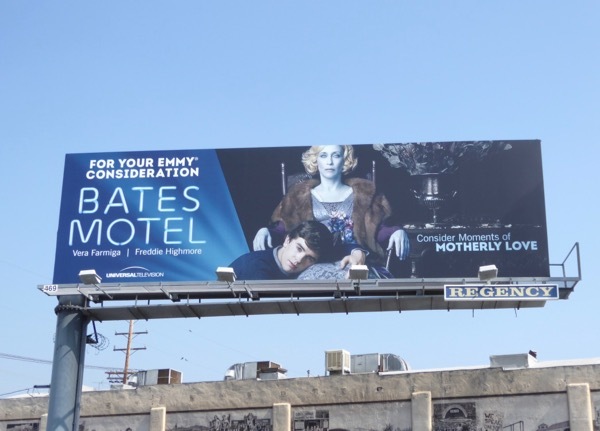 This Bates Motel Emmy consideration billboard was spotted above Fairfax Avenue on June 2, 2017. 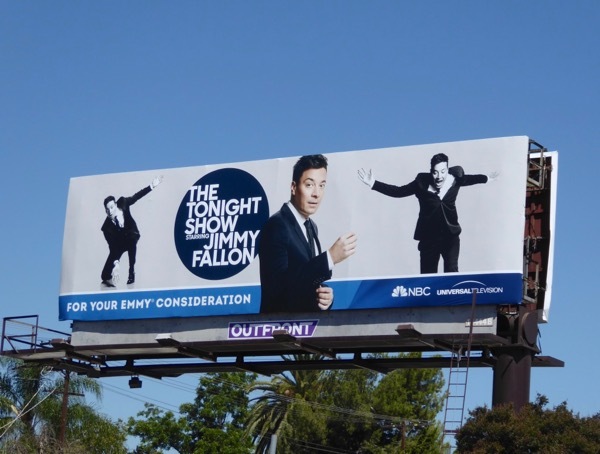 If you like this selection of TV ad creatives, make sure you also check out these Universal Television Emmy consideration billboards from 2016 and these 2015 Universal Television Emmy FYC billboards. And finally Happy Father's Day to all the dads out there, as an extra special gift Daily Billboard is adding an extra day to EMMY WEEK tomorrow for all the other studios, networks and channels like AMC, Starz, Comedy Central, TBS, TruTV, IFC, USA, WGN America, A&E and Lifetime. 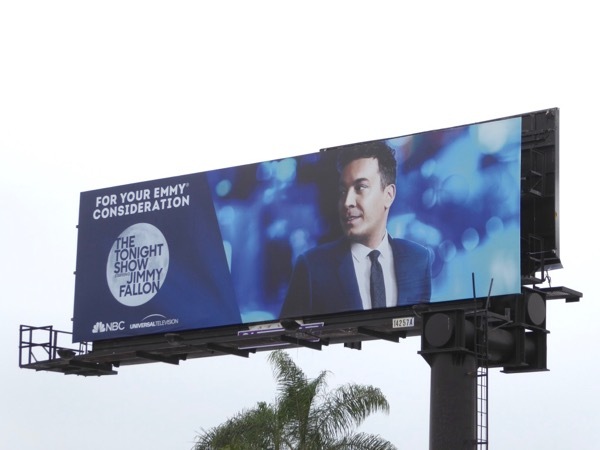 UPDATED: Here's also another Jimmy Fallon Emmy FYC billboard snapped along Lankershim Boulevard on June 27, 2017.